Really? On edge? The entire world? 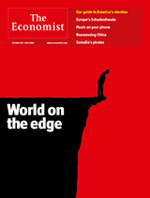 Interestingly, in the previous issue, the Economist, the most influential “newspaper” in the world, demanded that the US House pass the $700B bailout. Now? Not sure it’ll work (so tremble in fear you morons). Â And how is it that the media now views falling oil prices as bad and rising oil prices as good? Didn’t that used to run the other way around? Like two weeks ago? “Plunge”, eh? Nah, that’s not editorializing, sensationalistic, or overtly alarming for the sake of generating reader interest. 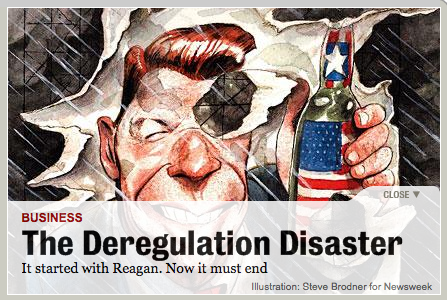 The article’s premise is that deregulation — and not monkeying with monetary policy — caused the current recession. And that the way to fix bad government is with more government. Newsweek delenda est. And no, they don’t deserve italics. Although the article talks about how what really happened is that most people didn’t realize that the economy was tanking when, in fact, it was — that’s not exactly how the headline link comes across. Although, to be fair, everything sounds calamitous in German. People who profit from inciting fear should be hung from their skin. Probably. And we certainly never pulled crap like this when I was at sportsTALK*. * = Just the 2000-01 parts. That’s a great collection of crappy news headlines. Thank you.